Fast live cell imaging confocal (Perkin Elmer spinning disk system). Equipped with 5 lasers (6 lines): Ar (488, 514 nm lines), Kr (568 nm), 2 blue diodes (405, 440nm) and red diode (640 nm). Hamamatsu EMCCD camera. Photokinesis system for photobleaching. Rapid switching between excitation/emission wavelengths. Piezo focus drive for rapid acquisition of image stacks. 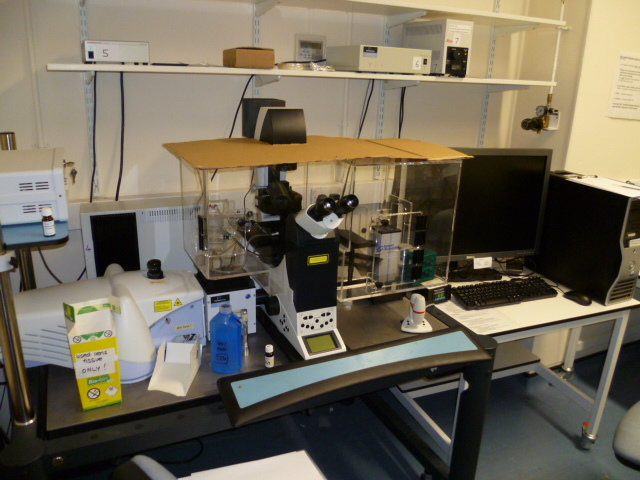 The system is attached to a Leica DMI6000 inverted microscope with a Solent incubator and is controlled by Volocity software.